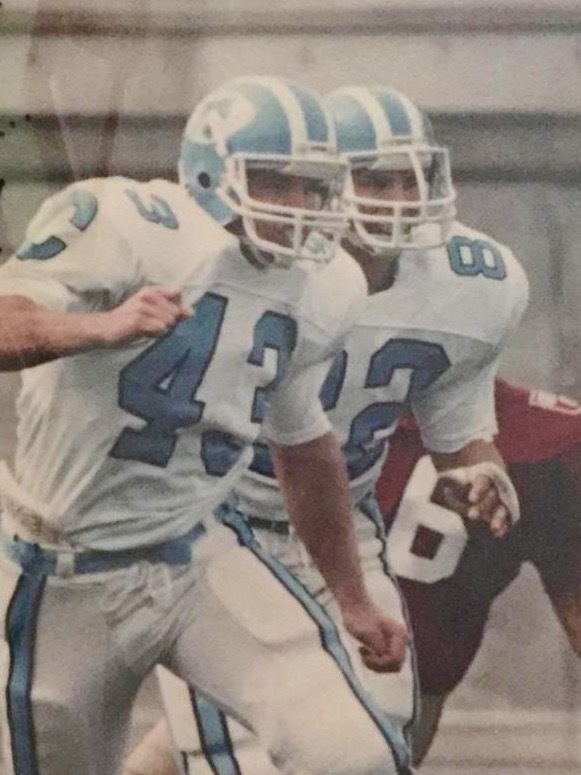 John Alex will never forget that cold October rain, the Baker Field mud, and the moment that last-second field goal attempt fell short nearly 27 years ago. Yes, alas, The Streak was over. John Alex in action for the Columbia Lions. Courtesy of John Alex. In Columbia’s debut against Harvard, the hard work seemed to pay off. The Lions held a stunning 17 point lead deep into the third quarter. Unfortunately, the Lions were shut out the rest of the way, and Harvard scored seven consecutive touchdowns, winning 49-17. In the post-game press conference, Garrett blasted his team, specifically the punter, and unforgettably referred to his players as “drug-addicted losers.” Alex says that the devastating loss was due more to the career-ending injury of defensive lineman, human wrecking ball Tony Tutrone, than the team’s psyche. Columbia didn’t win a single game that season, and Garrett stepped down at season’s end. Larry McElreavy took over, but the results were the same. Simply, Coach Mac needed more horses. “It’s frustrating. It’s depressing, but I haven’t had a week yet that I haven’t thought we could win if we played our game,” Alex told The Spectator, Columbia’s student paper. “If I thought we couldn’t win, I wouldn’t play.” As the losses continued to mount, Alex volunteered at the YMCA in Harlem, assisting with after school programs. In Alex’s junior year, Columbia got some horses. Columbia’s freshman team – fueled by two promising running backs Solomon Johnson and Greg Abbruzzese – went undefeated. At half-time, Columbia was down once again, 10-9. It wasn’t like the movies in the Columbia locker room. Coach Mac didn’t make a Rockne-esque speech. He simply told his team to pick it up. And the Lions did. With five minutes and 13 seconds remaining, and the Lions down 13-9, Johnson ran two yards for a touchdown. Princeton, more specifically, the Garretts, wouldn’t go away. 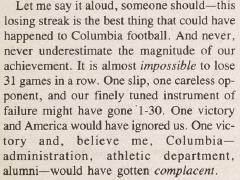 Keith Mano, “A Message from the Ultimate Columbia Fan,” The Columbia Spectator, September 18, 1987, 6. Zielinski needed this. All the Columbia players did. The Columbia players had been labeled losers – and worse. There was a well-documented, anonymous letter to The Spectator alleging steroid use and a controversy that a number of players had been admitted with substandard academic records, among other things. At times, portions of the Columbia community didn’t seem to really want a want a football team. Quidditch? Maybe. Football, tackle football, not so much. “I felt like we were the whipping boy for every cause du jour,” recalls Alex. The kick wasn’t even close, at least ten yards short. After five years of failure, The Streak, the bane of their existence, was over. Alex could exhale. Zielinski could bellow in euphoria. Coach Mac confirmed several times that the time had expired and wept openly. He was far from the only one. The Lions embraced and piled on top of one another. The Lions mascot took off his costume head and joined in. Columbia’s President scrambled to find his team’s locker room, where Alex was reunited with Coach Garrett, and they embraced. “He said ‘you should be in the pros,’” Alex recalls. Following the game, Abbruzzese was gracious in victory, giving ample credit to his teammates. He was also defiant, demanding more Ws. “The streak starts now!” Abbruzzese memorably declared at the time. Columbia managed to win just one more game that season, the finale against Brown. Regardless, they’d always have that glorious day in the Baker Field mud. Alex building houses in Nepal with United Aid, July 2015. Courtesy of John Alex. And then it was back to reality. Alex graduated, got a job as an assistant at Merrill Lynch. Two years later, he started his own firm. After 9/11, his moral compass kicked into another gear, and he volunteered in Jersey City, New Jersey. When the tsunami hit Sri Lanka and Indonesia in 2005, his sister, a Kansas City broadcaster, invited him to join her relief team. When Alex returned, he started United Aid and raised over $100,000. He wound up rebuilding three villages, helping more than 2,000 people in the ravaged Tamil area of Sri Lanka. Since, United Aid, which consists of about 10-15 core volunteers, including Alex’s two sisters and nephew, has helped thousands more, from Haiti to Louisiana to Nepal, where Alex visited this past July for a ten day mission. It was imperative to deliver tin sheet metal, to be used as roofs, and metal frames before monsoon season. They wound up building over twenty houses Alex says. In addition to housing, United Aid contributes food, medical supplies, and treatment. Along the way, several Columbia players have made plays for United Aid. Quarterback Chris Della Pietra wrote a rousing letter asking for support. Defensive lineman Sean Fuller was right by Alex’s side when he went down to help with Katrina. Defensive end Paul Tomasi quietly but quite effectively contributes funding. There are countless others. Alex is hopeful that Columbia, which has a new leader, former Penn coach Al Bagnoli, can turn things around on the field. The current Columbia players weren’t alive for The Streak, but they’ve certainly heard about it. Meanwhile,Alex has bigger things on his mind. In addition to disaster relief, Alex has adopted a Romanian orphanage. It’s half-time for John Alex, give or take. At Columbia, Alex won two football games. After, Alex has saved countless lives. John Alex and Columbia football are winning. Jon Hart is the author of Man versus Ball: One Ordinary Guy and His Extraordinary Sports Adventures, www.manversusball.com. Find him on Twitter @ManVersusBall and Facebook https://www.facebook.com/ManversusBall. quidditch? seriously? Harry Potter didn’t exist until almost ten years after this. We waited for basketball. And they walked at least(part of) one of the goalposts all the way down Broadway. Why was the Columbia so unsuccessful throughout the 44 consecutive games they have lost? But throughout the article you learn a very big lesson, which can happen to anybody. The lesson I believe that is being told is that, No matter how may times you fall, always get back up and try again. In which the Columbia team did. They had finally won a game against Princeton. For John Alex, he has something to remember forever. Another question is that did John Alex every get a professional contract or a tryout to the NFL? As in the article was stated by Coach Garrett “you should be in the pros”. For Columbia they showed that anything is possible if you put your mind to what you want to achieve. I liked how the team was on a 24 game losing streak, and was able to snap that losing streak. Snapping a losing streak of that many games is a great feat. I would like to know what the reasons were for them losing that many games in a row. It must have been extremely hard for the players on the team to stay focused knowing that they are on a 24 game losing streak. I have been on a basketball team that didn’t win a game for the whole year. It was definitely difficult to stay focused. The Columbia team must have had the captains get everyone on track to stay focused on winning the game because they were able to win, and that may have been a big reason. They were definitely struggling before they snapped the losing streak because they lost to Harvard 49-17, and Harvard is not that good of a football team. The unfortunate thing was that they were winning by 17 earlier in the game and lost the lead and the game. Hopefully, Columbia can find a way to be successful for years to come. Man vs Ball’s John Hart strikes again! Hart is on the pulse of authentic athletic and personal stories that are best told through his keen and humorous touch. They were on a 44 game losing streak, how is that even possible in this day and age of college football? Obviously, their players were not very good or their coaching, but I cant imagine the Ivy league competition being so good up and down the conference. I would like to know how many coaches they had during The Streak because I think the lack of coaching stability could have also led to the streak. Having new coaches come through a program every year is not very healthy for the players or the growth of the program. I think there is a great lesson that comes from this article and that is to keep putting one step in front of another and do not look in the rear view mirror, but just keep looking forward and working hard. I think this streak and this win taught John something that he carried the rest of his life. I think it taught him that he could contribute to a “winning” team even in times of adversity. Yeah, Alex did not have the stellar college football career he probably wanted, but because of his time as a Columbia football player, he is able to help others get through adversity and he is able to contribute to others’ success as he helps them get back on their feet after natural disasters occur. Being on a losing team is hard. It really tests your mental strength, but once you break through, you feel like you can accomplish anything after enduring so many hardships throughout the season. Thats what I think has fueled John Alex’s idea of United Aid. Because of what he went through in college, he is able to relay that same message of overcoming hardship to the people he helps with his foundation. He can tell them to keep putting one foot in front of the other and keep looking forward because if you continue to do that, your breakthrough moment will come and it will be great. Great great article. Love the lions.